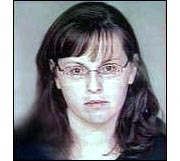 Mary Corrigan, 33, was charged with child neglect after it was discovered that she locked her three children, 6, 8, and 10, naked in a bathroom for long periods of time and forced them to drink vinegar, eat hot peppers, and take cold showers as a punishment for bad language. The children were also malnourished and covered in rashes. They had attended public school until the previous year, when school officials filed a report of suspected child abuse and Corrigan responded by withdrawing the children to be homeschooled. The children were discovered after neighbors reported “banging and screaming” coming from the apartment. Two of Corrigan’s friends, who lived with her and the children, were also charged. The family lived in Indiana.